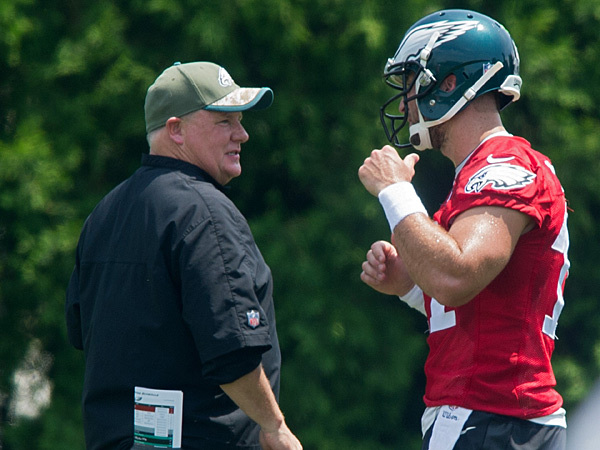 The Philadelphia Eagles signed Tim Tebow, giving the quarterback another chance to try and start a season on an NFL team, but without him moving up the depth chart, it is unlikely he’ll even be on the roster when the 2015 season begins. At the moment, Tebow is fourth on the depth chart, behind Sam Bradford, Mark Sanchez and even Matt Barkley. Tebow hasn’t played an NFL game since 2012, and hasn’t been an actual quarterback since 2011, when he helped the Denver Broncos make the playoffs and even throw a game-winning touchdown in the Wild Card round against the Pittsburgh Steelers. While Tebow has worked a lot on his motion and throwing, it hasn’t really moved him into a position he’ll be a starter through or even a 2nd-string QB. He’s battling with Barkley, a player the Eagles tried to trade earlier in the season, for the third and final spot. There’s an argument among those who cover the Eagles when it comes to trying and putting the chances of him making the final cut into numbers. Sports Insights has it at 31%, while others, like Eliot Shorr-Parks of NJ.com thinks Tebow, despite his low moments during his short time with the Eagles, including missing wide open targets and sending passes into the ground, that his odds of staying are better because of the different approach he offers the Eagles, while battling for the spot with the struggling Barkley.